Are you the kind of person who likes to keep track of things? Even better if you can use your smart phone or tablet to help with that! 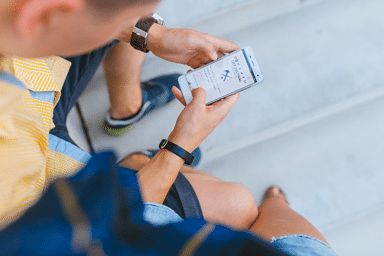 Here are a couple really useful apps that you can use on your Apple or Android phone or tablet. 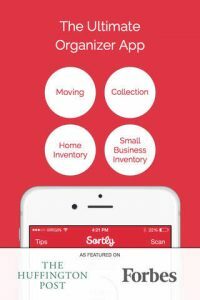 Sortly is a great app for keeping your belongings together. 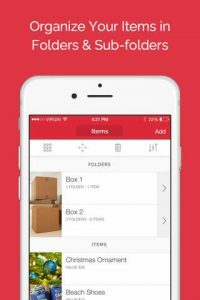 A bright, well designed and easy to use system for cataloging your stuff, so you can actually find them later. 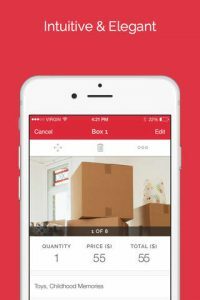 Perfect for organizing your household items before your big move. Track your things with photos, locations, tags and notes, then access them anywhere with the cloud storage service. The app is free to download and use, and you also have the option to upgrade to a premium cloud service, offered as auto-renewable subscriptions (monthly- $0.99, annual- $9.99 and lifetime- $39.99). The app is uncluttered and intuitive. 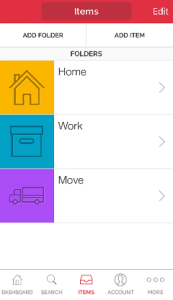 It comes preloaded with suggested locations (home, office, travel etc). There’s a handy tutorial to get you started and a sample location, preloaded with items for you to learn from. You can set up to three levels of hierarchy for your locations: e.g. Kitchen, First cupboard on the right, Bottom shelf. You can then add multiple photos for each location (up to 8), customizing with arrows (so you can actually point out the location of the item on your photo). You can then tag and add notes to your locations and photos for searching. Sortly automatically learns your words for quick typing later. Save to the cloud so you can access your items from any of your devices. If you want, you can also export notes to Evernote or export and import CSV files.